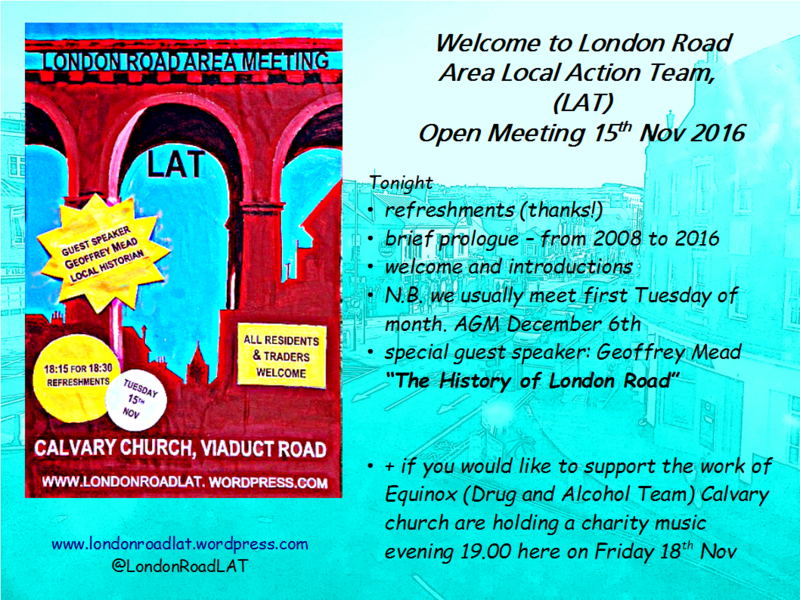 Each year we hold a meeting showcasing one aspect of London Road or another. A few years ago we highlighted all the positive improvements that were in the offing – like the Level, the redevelopment of the former Co-op, Providence Place gardens etc. All of these are now in place. 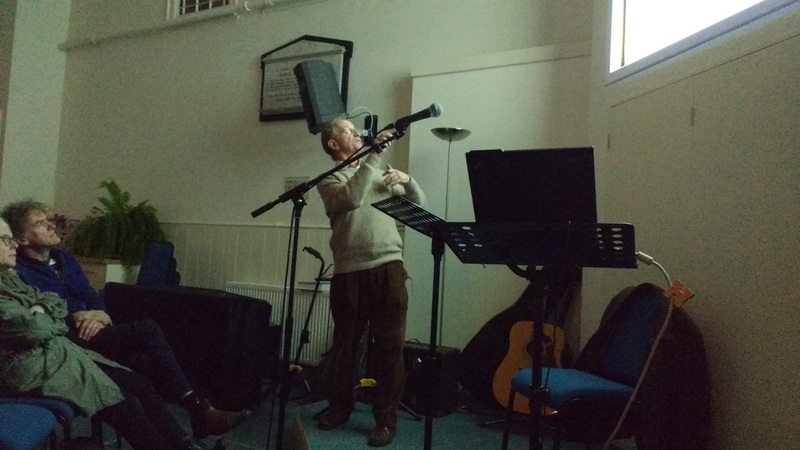 This year we looked at the history of London Road with Dr Geoffrey Mead. Our speaker writes: London Road has undergone rapid change recently. It used to be a family shopping street until the late 1980s, then it spiralled down to become a rather seedy area by the Millennium, but now is on the upturn! The Open Market, The Barrows, New England Quarter, The Level, all testify to this. We also have a range of individual shops and ethnic outlets blossoming in London Rd itself. This talk looks at some of the historic background to the area and the resurgence of these last few years. 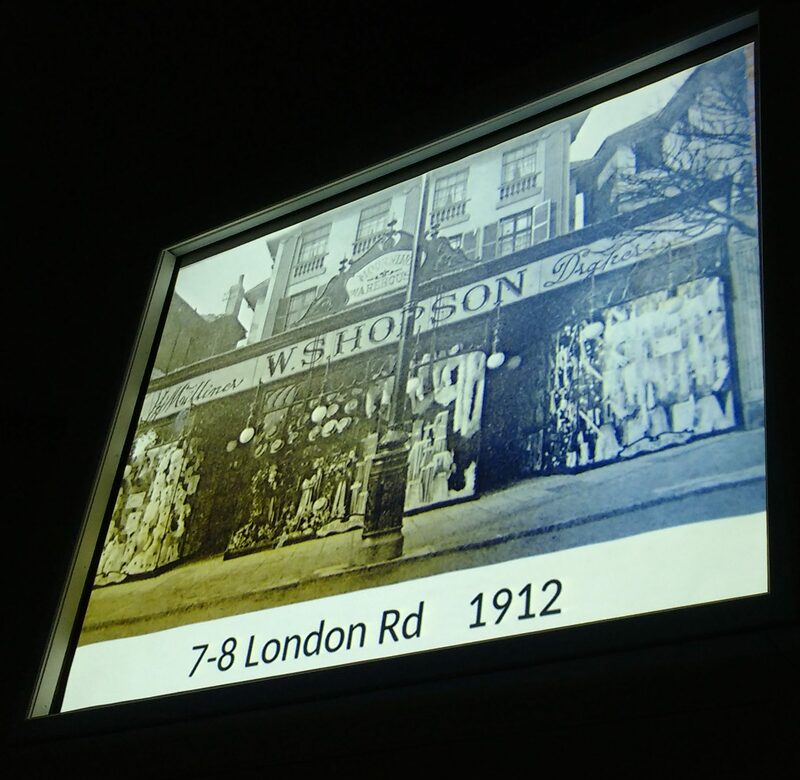 The eminent popular local historian took us on an illustrated virtual tour of London Road. He started by referring to very old maps which showed the Anglo-Saxon field system of Brighton. Even today our streetscape matches these ancient angular boundaries – e.g. Baker Street, Oxford Street, North Laine. He showed us how the beautiful front gardens of fashionable residences were encroached on by street-widening for trams. Older buildings which protruded were knocked back when the trams needed more space to turn a corner – hence the newer (Victorian) buildings on corners, such as the Hobgoblin, and Presuming Ed. He also charted the rise and fall and rise of Marks and Spencer’s and Sainsburys and the Open Market in their different incarnations along London Road. Thanks to all who attended, and thanks to Geoffrey Mead for a fascinating presentation.